Photograph: Prudence UptonL-R: Andrew Jones, Nicole Car, Anna Dowsley and David Portillo. 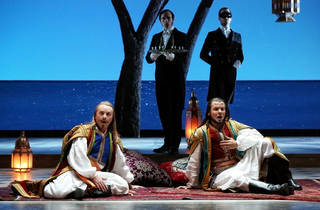 Could it be the finest opera ever written? 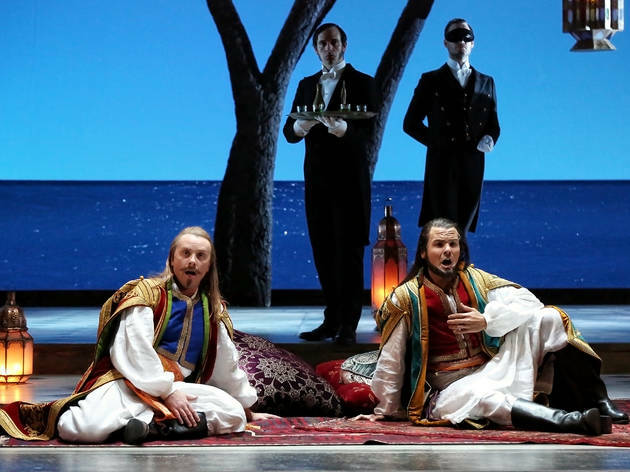 Yes, this landmark new production by Scottish director Sir David McVicar for Opera Australia presents a compelling case that the prize should go to the 1790 collaboration of Mozart and the Venetian-American poet Lorenzo da Ponte. 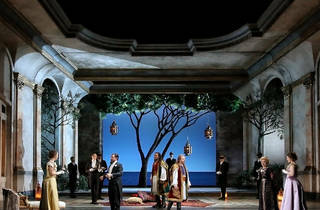 Così fan tutte has never required much more than six fine actor/singers to produce the most profound reactions from audiences: no talking statues, no flying Viking helmets, not even a mask or a clown costume, just a decent staging of a few average people trying to cope with the everyday problem of infidelity. Even though the mostly shallow characters rarely speak sincerely, every adult in the audience relates to what they are feeling. Three hours of unsettling beauty pass all too quickly, and end with an ominous uncertainty. Will they all live happily ever after? Unlikely. The critical success factor here is simply taking the preposterous comic premises of the plot seriously, which rarely happens. Of course the music must also be well played, which is certainly was on opening night, superbly paced and coordinated by expat Brit Jonathan Darlington. Plus there was a second conductor in the pit: the luxury casting of OA associate music director Anthony Legge on the fortepiano; his exquisitely sensitive accompaniments turned the keyboard recitatives into a highlight than rather than mere tinkling filler between the orchestrated arias. 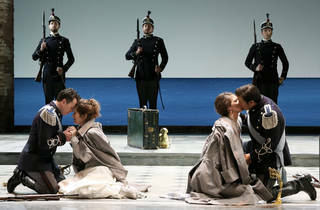 Da Ponte’s original plot consists simply of a cruel and cynical bet proposed by the wily old Don Alfonso that two sisters can be enticed to cheat on their boyfriends within 24 hours: hence the title of the opera, here subtitled “All women are the same,” but more literally translated as “Thus do all (women).” Alfonso requires his two soldier suckers to fake a departure to battle, then promptly return disguised as foreigners to woo and screw. Of course it’s highly implausible that both girls would get through the physical intimacy of the decisive night without recognizing either man, but this imagined effectiveness of disguises is the only demand on the audience’s suspension of disbelief: a very mild one by the standards of an artform grounded in myth and legend. 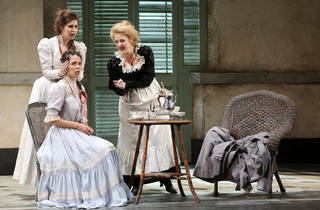 The six soloists are all first-rate and nicely cast; the glamorous Taryn Fiebig’s endearing handling of the role of the unglamorous maid Despina was a particular delight. 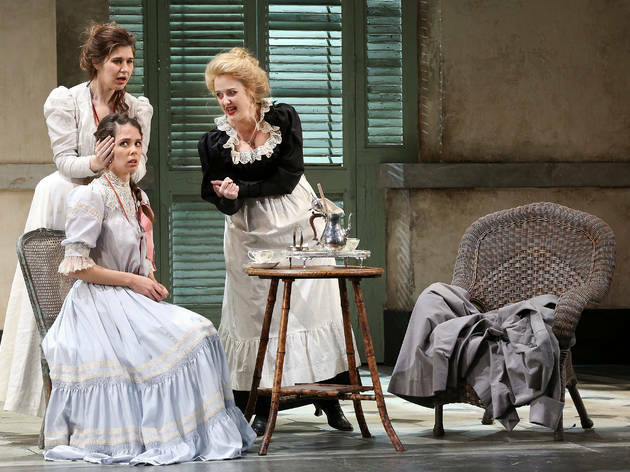 The off-stage girl-next-door persona of soprano Nicole Car proved especially suitable in the role of Fiordiligi, who tries much harder to resist than her sister. 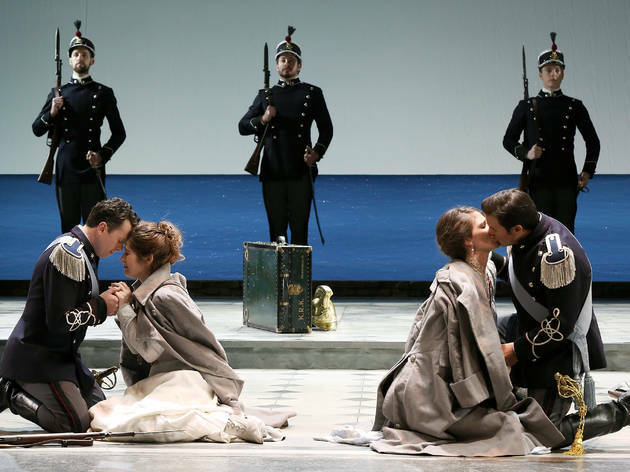 And Car’s impressive performance in those notoriously difficult arias Mozart wrote for his librettist’s mistress confirmed the judgement from our last few reviews that Sydney now routinely has in the Joan Sutherland Theatre a voice worthy of that name. 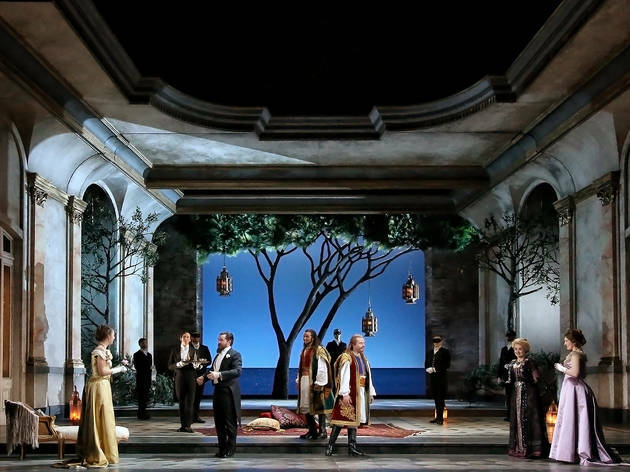 Remarkably, this star did nothing to upset the delicate ensemble acting that is critical to da Ponte’s symmetrical dramatic structure: everyone kept everything perfectly balanced. Brava! Bravo! Bravi! Yet no significant detail in this production is carelessly left to the customary. It will surely get full marks from everyone: the old fogeys and tourists looking for a period piece to mention on their Instagram posts, nearsighted audiophiles who just want to shut their eyes and hear the best music ever written, and most of all, to those theatregoers with open minds who are interested to hear what two geniuses have to say about a problem that deeply affects most human beings: we’re all like that.